You'll be £14.99 closer to your next £10.00 credit when you purchase Monty and Patton. What's this? Michael Reynold's account compares the lives of Allied generals Bernard Montgomery and George Patton. Born two years apart, both were commissioned within a year of each other and both were wounded in France in the First World War. Both encompassed very different but very valuable characteristics in combat: Monty - careful and meticulous, Patton - dashing and diplomatic. Despite the differences, both generals demonstrated striking similarities: commitment to their careers, a ruthless egotism, interesting when you consider neither held superior command. This did not impeach their desire for the limelight and fame in warfare, arrogance and the manipulation of colleagues in high places to advance their careers. Both were machiavellian in their own affairs and self-interested in their own personal progression. Neither Monty nor Patton were pleasant people, they did not like the other very much, but their ambitious and calculating personalities make them fantastic subject material. Reynolds includes their contributions to the victory in North Africa and Europe as well as a superb overview of their respective command. Mike Reynolds is a former British infantryman who finished his career as Director of the Plans and Policy Division in NATO HQ in Brussels. He is a recognised authority on Second World War operations in Europe. There are many soldiers who have glittering careers filled with awards of the highest order and a military service unblemished by mistake however it is usually the brilliant yet flawed that the people truly love. Two Paths to Victory describes two Generals who fit perfectly into the latter category, Bernard Montgomery and George Patton who may never have held supreme command but exhibited a flair and magnetism that saw their peers look up to and obey them without question. The book details everything from The Battle of the Bulge to England before D-Day along with the separate and combined exploits of Monty and Patton. Through intriguing images and accurate maps, the prose is gripping and informative. With his own experience as a British Army infantryman, Michael Reynolds has created a book with as much style as the two generals themselves. In this wonderfully detailed and comparative account, Reynolds traces the paths of perhaps the two most influential generals of the Second World War, Bernard Montgomery and George Patton. He begins with their respective childhoods and guides the reader through the highs and lows, the trials and tribulations, of their distinguished military careers. He goes beyond the typical biography style and presents their stories in tandem, giving the reader a unique chance to compare the lives of these endlessly interesting individuals. Monty and Patton, in their early years, experienced remarkably similar military careers, both being commissioned within a year of each other and both being wounded in France in the First World War. Drawing from existing biographies, Reynolds details how both men went on to become successful generals in the Second World War and how they led their troops to victory in quite different fashions. Despite their different paths and similarly arrogant yet professional personalities, Reynolds does well not to make this a competition. This is a fair and benevolent account of the careers of two celebrated generals of war which makes for surprisingly light yet consistently engaging reading. 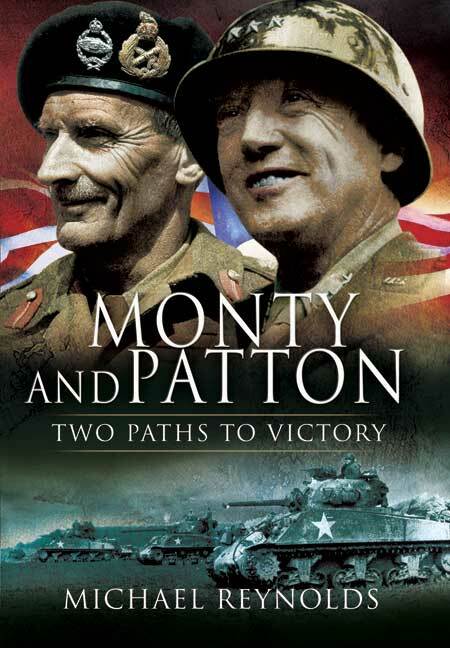 Monty and Patton: Two Paths to Victory is, quite simply, essential reading for all wartime enthusiasts. Bernard Montgomery and George Patton were the two most famous Allied generals in World War II, and Michael Reynolds attempts to highlight the vital contributions of men both so different in character, yet who as leaders shared such similar traits. What is immediately refreshing about this piece is the way in which it goes beyond the one-dimensional biography of a 'war hero' - both men were great leaders and their efforts were key to Allied victory, yet we also learn how the generals were equally capable of grave mistakes, along with a shared arrogance and vanity perhaps ironic considering their disdain for each other. Indeed, one wonders what the two men would have made of Reynolds' angle here; they certainly would have enjoyed the attention but surely would scoff at such a direct comparison which highlights just how similar they were despite their mutual dislike. As Reynolds himself states, much has already written about these figures, yet never before have their lives both on and off the battlefield been juxtaposed so directly; Monty, the stiff-upper-lip, careful and meticulous Brit, and Patton, the rash, carefree, 'foul-mouthed' Yank. The author flicks back and forth in retracing their lives from their remarkably different backgrounds, onto their eerily similar trials and tribulations in World War I service, through to their 'Paths to Victory' in their own style during the Second World War. What Reynolds clearly tries to avoid is to make this a competition, making one man seem 'better' than the other, and it is left to the reader to make their own judgments. Learning of both men's character flaws, mistakes and egotism for me does little to diminish their overall contributions, rather it just makes them seem more human and 'real', therefore making for an engrossing read.